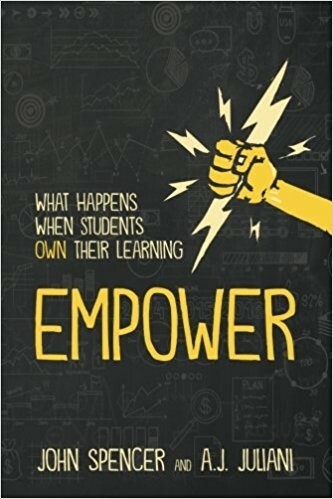 I just finished reading Empower: What Happens When Students Own Their Learning by John Spencer and A.J. Juliani. I recommend it for teachers and instructional leaders. As I read, my thoughts kept shifting from the book’s focus on empowering student learners to a focus on empowering teachers; especially through their participation in professional learning communities (PLCs). I see many teachers approaching scheduled PLC sessions as a compliance activity. Sometimes they attend a PLC that has been planned by an instructional coach or curriculum coordinator. In these scenarios teachers are given tasks that someone else has decide are important to be completed. A PDF from ASCD posts these descriptors of compliant student learners. How many have you seen observing a PLC? The ASCD PDF identifies these descriptors for engaged learners. I think these actions are most likely to occur with Couros’ description of the empowered learner. Without empowerment, it is unlikely these behaviors would continue for an extended time. The Launch Cycle framework laid out in Empower for classrooms (pages 101-107) can be adopted to PLCs. #1 Look, Listen, Learn: In PLCs I describe this step as identifying the sense of urgency. What do you want students to achieve or experience that isn’t happening now? While this includes looking at student work and data, it also means sharing PLC members’ vision and passions. Why do I choose to teach? #2 Ask Tons of Questions: Just as students’ questions engage an inquiry process that drives learning, teacher questions should spark the work of a PLC. Too often, the PLC process begins with teachers responding to questions that have been given to them: sometimes with a due date for answers. This encourages compliance and teachers focus on completion. #3 Understand the Process or Problem: The research conducted by the participants is driven by their questions. I worked with a PLC of middle school special area teachers who identified 10 grade eight students who had not shown engagement in any of their content or activities. “Reaching” these students was selected as their PLC goal. To start understanding, each teacher conducted an in-depth interview with two of the students. #4 Navigate Ideas and #5 Create a Prototype: Effective PLCs keep initial ideas on the table for brainstorming, combining, and analyzing, eventually leading to an idea for experimentation. I believe it’s critical that the understanding is that the idea needs enough merit to start, not a sense of guarantee that it will work. #6 Highlight What’s Working and Fix What’s Failing: For these initial assessments, I believe it’s critical that PLC members have both a picture of the desired outcome success as well as what “signs of progress” or initial evidence would encourage continuing in the direction that was chosen. #7 Launch to an Audience: For PLCs this is the spot that they take their created actions and the initial signs of progress to a broader school audience. This expanded audience has the chance to learn from the PLC’s thinking, research, and experimentation. The PLC has the chance to gain insights and ideas from the audience advancing the PLCs’ students’ success. Just as teachers are at times challenged by empowered learners, (See John Spencer’s list of teacher fears of empowering students) school leaders can be challenged by empowered PLCs. Passionate risk-taking teachers will challenge existing policies, schedules, structures, etc. that they feel are in the way of achieving the desired learning goals for students. This blog is spot on. I am curious about what others think. Has anyone embarked on this in a low socio-economic school in elementary? I was fortunate enough to work in an middle income elementary school for 2 years where I was half time Gifted Resource Teacher recently and half time some place else doing administrative like tasks and trying to coach. My 3rd, 4th and 5th grade students were able to work on passion projects. They loved them! Lots of student agency and I loved the whole process. I only had them for about 30 minutes 2x a week. In retrospect, things would have been more fun if we had had more time together. GT kids in general have a lot of self motivation, so it ends up being adequate. So as I think of empowering an entire classroom or for periods of time, I think, wow! Pursuing questions of value, such as why we cannot engage 10 kids, or why these 5 kids will not do ____, I start to get excited about the possibilities for the fall. Maybe I can light a fire of passion for teaching! Why not?